In our hectic modern day lives sometimes we need to take time out to rest our ever-cluttered, chattering minds and relax. Stitching with Needlepoint is the perfect way to focus the mind, bringing with it a feeling of calm and satisfaction upon completion. Now renowned artist Cindy Lass brings her original, beautiful works of art to life with Cindy Lass Needlepoint. 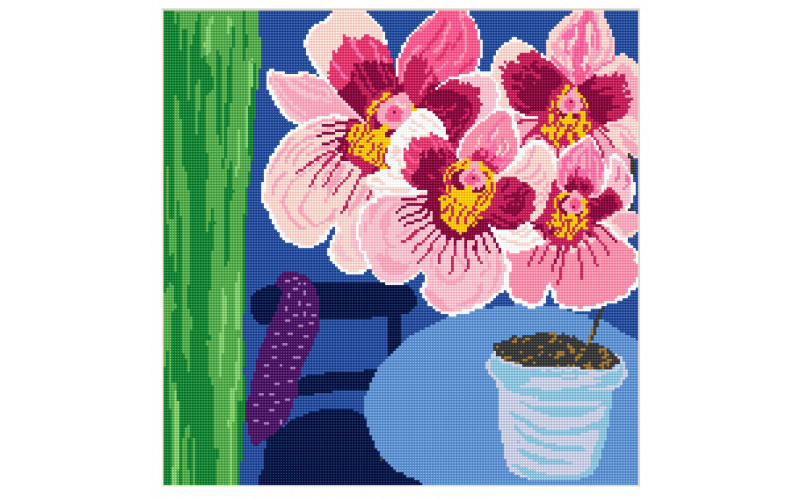 We have six Needlepoint kits of painting Sweet Wonders, George Michael’s favourite flower the orchid, also known as the sweet wonders of life, from Cindy Lass’s Celebrity Flowers show. Cindy Lass believes passionately that painting should come straight from the heart, a self-taught artist she has been painting for more than 20 years and has acquired a huge fan base of admiring art lovers, including celebrities such as Sir Elton John, George Michael and Victoria and David Beckham. Her famous painting of The Queen’s Corgis now hangs in The Queen’s private quarters at Buckingham Palace and her Celebrity Pawtraits saw her painting the dogs and cats of international stars including Dame Elizabeth Taylor, Shirley MacLaine, Brad Pitt, Geri Halliwell, Bill and Hilary Clinton, Heidi Klum, Sarah Jessica Parker and Kim Cattrall. Cindy Lass Needlepoint kits make the perfect gift for a loved one or a gift to yourself. It gives you a chance to own a piece of Cindy Lass’s art from the heart, her world of colour that will sooth the soul and bring you joy. Some of Cindy Lass’s best loved designs being brought to life as Needlepoint kits are: All Our Hearts Beat As One, Sweet Wonders and Tiger Lily, The Queen’s Corgis, Hank the Dog, Socks the Cat and Take A Swing. These beautiful artworks handpicked by Cindy Lass would make the ideal Mother’s Day or Easter gift.